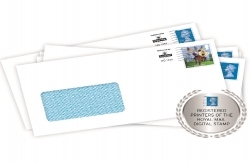 Heritage Envelopes Ltd produces on average 50 million envelopes a week and we overprint 2.5 million each week. We can achieve this through the continued investment that we make in production capability. At any one time we have in excess of 500 tonnes of various papers in stock, including our FSC® and PEFC certified lines. Our stock system is designed to ensure that we can offer shorter lead-times than most of our competitors. We actively promote environmentally conscious practices, including the prevention of pollution. We maintain high working standards and continue to improve performance by providing relevant training to all our employees.